EquipNet helps our clients sell, manage, and source equipment that is surplus to their operating needs. EquipNet's asset management services, when utilized exclusively, have helped our clients add between $2-10 million to their bottom line each year. Free up space, save time, and save money by using EquipNet as your exclusive asset management vendor. Whether it's a facility closure, a facility revamp, or simply a few excess items, EquipNet will craft a disposition project to help your company maximize cash value recovered from surplus assets, while ensuring efficient, cost-effective clearance. Gain visibility across your organization using EquipNet's Asset Redeployment Management System (ARMS). Track, redeploy, manage, and sell assets throughout your organization. Save more time and money by sourcing premium, pre-owned assets on the second-hand market. 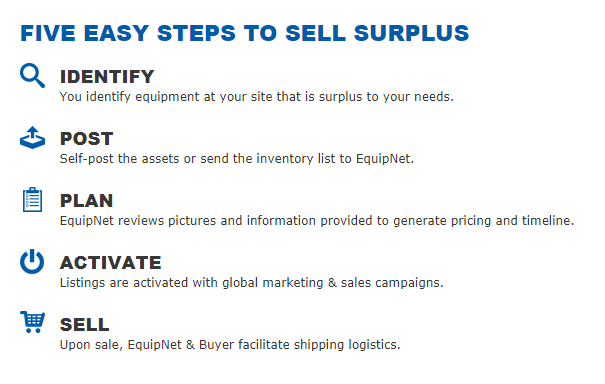 EquipNet’s MarketPlace, is the largest online venue for buying and selling surplus equipment in the world.